Looking for hotels near Golden Gate Bridge? Built in 1903, Hotel Drisco features Edwardian architecture. Atop Pacific Heights on Pacific Avenue, this luxurious San Francisco hotel is only 5 minutes' walk from Presidio National Park. Near San Francisco Bay, this historic Sausalito, California resort is located in the Golden Gate National Recreation Area. The resort features a full-service spa and Murray Circle Restaurant. Located in San Francisco, the Cow Hollow Inn and Suites offers nonsmoking accommodations to guests. Free self parking for 1 car per room and free WiFi is provided. In one of the oldest neighborhoods in San Francisco, California, surrounded by restaurants and shopping, this inn offers unique guestrooms and first-rate services. A pet-friendly hotel in San Francisco's Pacific District, this property features comfortable guestrooms and easy access to popular attractions, including the Presidio. Featuring a garden, Parker Guest House is located in San Francisco in the California region, 1.5 miles from San Francisco City Hall. It was super easy to get around from this location. Built in 1903, Hotel Drisco features Edwardian architecture. Atop Pacific Heights on Pacific Avenue, this luxurious San Francisco hotel is only 5 minutes' walk from Presidio National Park. I liked everything! The service and how they treated us! It was amazing!! Built high atop Ghirardelli Square with San Francisco Bay views, this urban San Francisco resort features luxurious apartments with free WiFi and fully equipped gourmet kitchens. Location, Facilities, Surroundings, Apartments desgin and Staff. Located at the top of Nob Hill in downtown San Francisco, overlooks Grace Cathedral. This luxury hotel features spacious rooms and an award-winning spa. The staff is great. They will do anything to meet your needs. This European-style hotel is located 1 block from Union Square Park and 4 blocks from the Powell Street BART Station. It offers rooms with a flat-screen TV and free WiFi. The location of the hotel is very close to the city center. The traffic is very convenient. Coventry Inn offers accommodations between the Golden Gate Bridge and Fisherman's Wharf in San Francisco. Free WiFi and free covered parking are offered to guests. The staff was outstanding, very pleasant and helpful. Fiber optic free WiFi, sensor locks and online check-in make staying at the Axiom Hotel a technology forward experience. Lounge areas in the on-site bar are featured. The receptionist, Katherine (Catherine) was super helpful. She made my stay at Axiom perfect! Offering a fitness center, Hotel Zephyr San Francisco is located a short 984 feet from Pier 39 Fisherman's Wharf. Free WiFi access is available in this waterfront hotel. Great location,great room and great staff. Located adjacent to the Powell and California cable car stop, Stanford Court San Francisco is a technology-friendly boutique hotel that features a lobby and business center equipped with 7 MacBooks,... Really great location. It's in the "posh" area of San Francisco. Located in the Marina District of San Francisco, the Seaside Inn is within 10 minutes’ walk to the Marina Green and renowned shops and cafes on Chestnut and Union Street. Yogi so courteous and helpful and gave personal attention. Great location to all attractions. Located next to the the Moscone Convention Center, this downtown San Francisco hotel offers luxurious rooms equipped with flat-screen TVs. Facilities include a fitness center. Excelent service, facilities, cloud like bed, clean, delicios food, fabulous location!! Loved it! Located in San Francisco’s quaint Nob Hill neighborhood, this hotel near the Golden Gate Bridge and Union Square offers on-site dining. Guest rooms feature city or bay views and free WiFi. Plenty of staff to attend to any requests. 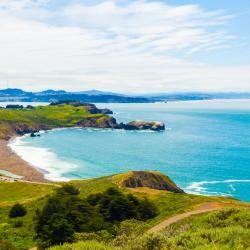 Hotels with great access to Golden Gate Bridge! Offering free WiFi, Hotel Sausalito is located in Sausalito. Featuring a 24-hour front desk, this property also provides guests with a sun terrace. The hotel was lovely, the staff so very nice! Located 3.7 miles from Golden Gate Bridge, The Gables Inn Sausalito provides accommodations with free WiFi in Sausalito. Small size hotel, very quiet, nicely decorated, made me feel like at home. Located on the edge of Richardson Bay, just 5 miles from the Golden Gate Bridge, this Mill Valley hotel features a full American breakfast buffet each morning. Free WiFi is included in each guest... Beautiful hotel rooms open right into to bay. You wont be disappointed. Great hotel. Relaxing. People are talking about Golden Gate Bridge! Explore guest hotel reviews featuring "Golden Gate Bridge"
Felt like stepping back in time and enjoyed it. Historical atmosphere and genuine 100 years old style. Not to worry about shared bathrooms and toilets, these are stylish once you see them. Expect short delay with warm water in bathroom (thats genuine too i guess). Must be owner who parks his oldsmobile car in front of hotel every day. Fisherman Wharf is just short walk distance from hotel with views to Alkatraz and Golden Gate Bridge, as well as historical tram car stations. Helpful stuff and quiet hours from 10 PM to 8 AM. The staff were extremely friendly, courteous and accommodating. My budget was limited so this was the only place I could afford to stay that was not a hostel with a shared bathroom. When I arrived I was stunned that the location was so close to Presidio Park and amazing views of the bay and Golden Gate Bridge within short walking distance with a wide array of restaurants in the surrounding blocks. Location. This is a hidden gem. Only one block up from the cable car road taking you into the heart of town. Everything was accessible even the roads to Golden Gate Bridge and beyond. The hotel is a museum and memorial to the U.S Marine Corp and is tastefully decorated on each floor. And the Italian next door (sorry I can't remember the name) did the best linguine ever. They had free parking which was really nice, the staff was very relaxed and let us keep our car on site while waiting for check in. The property is in a great location with everything you need to see only a mile or two away. The room was clean but the furniture was cheap. We grabbed some jump bikes that were around the area and took them across the Golden Gate Bridge. Our 9th. floor room came with an excellent view of the Golden Gate Bridge. The complimentary breakfast was filling. The location was very convenient. We were able to walk to Fisherman’s Warf, an easy 15 minute stroll. China Town and North Beach are within fairly easy walking distance as well. The room came with a fridge, which was an unexpected treat. Friendly staff, nice breakfast, enough places to sit after a long day. Beds were comfortable and wifi was good. Nicely located close to the golden gate bridge and with a view at the ocean. It was a large hostel with a place to buy food/drinks. The bed was great and the location was fantastic. Area was safe to go for a run in the Marina district and just a couple miles from the Golden Gate Bridge.